The rise of leveraged loans: a risky resurgence? Leveraged finance, comprising high-yield bond and leveraged loan-based finance, has doubled in size since the Great Financial Crisis (GFC) (Graph A, first panel, shaded areas). A vehicle for investors' risk-taking, leveraged finance has behaved procyclically. The market for financing highly leveraged transactions flourished in the United States in the 1980s before collapsing during the recession of the early 1990s. It again grew rapidly in the mid-2000s before stalling during the GFC. Leveraged loan volumes have been particularly procyclical - rising faster than high-yield bonds in the run-up to the GFC and during the subsequent period of extraordinary monetary accommodation (Graph A, first panel, red line). Focusing on the recent growth of leveraged loans, this box examines the underlying drivers and the vulnerabilities that monetary policy normalisation may expose. 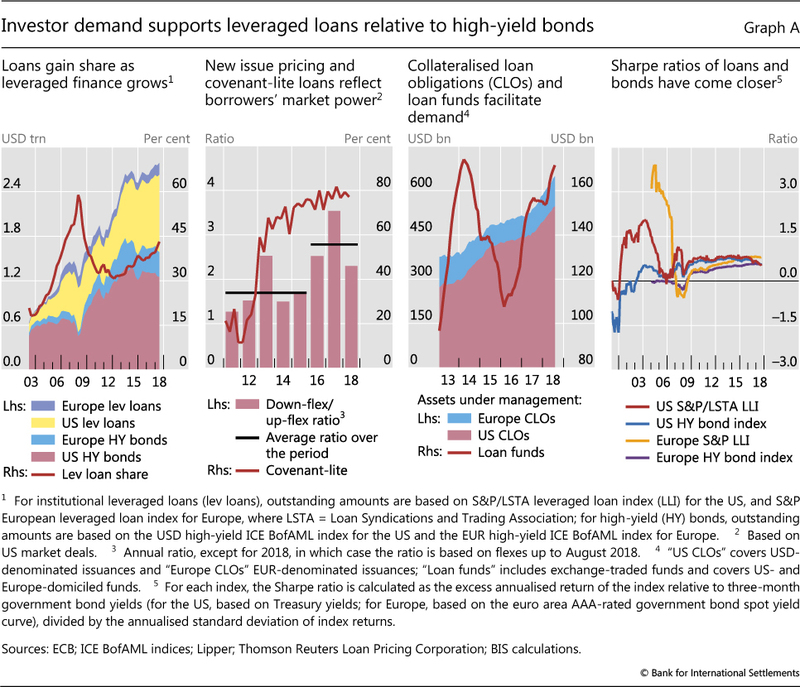 Investor demand is an important driver of the recent growth in leveraged loans. For one, this is evident from investors' continuing willingness to accept weaker protection against deterioration in borrowers' repayment capacity. Specifically, the fraction of covenant-lite loans reached its post-GFC peak in late 2017 (Graph A, second panel), while the average number of covenants per loan with covenants has decreased by 25%. That investors are not necessarily being compensated for this risk can be seen in the behaviour of price flexes: adjustments to new-issue spreads that a loan arranger makes in order to clear the primary market. The ratio of down- to up-flexes has risen markedly in recent years, with borrowers benefiting from lower loan spreads (Graph A, second panel). In addition, strong investor demand for leveraged loans has supported refinancing. In the United States, for instance, debt refinancing has accounted for 60% of institutional leveraged loan issuance since 2015. This share increased during the first half of 2018. All this is consistent with investors reaching for yield in a low interest rate environment. The recent prospect of (continued) interest rate rises has increased the relative appeal of leveraged loans, which - unlike most high-yield bonds - offer a return that is indexed to the interbank rate. Developments in the securitisations market have also contributed to the growth in leveraged loans. Originator banks are finding it easier to securitise and sell these loans. This can be seen in the growing investment in loans by securitised structures such as collateralised loan obligations (CLOs), especially in the last couple of years (Graph A, third panel). Unlike during the run-up to the GFC, banks no longer effectively retain a large portion of these securitisations through off-balance sheet vehicles. Instead, the post-GFC risk retention rule requires banks to retain a relatively small portion of issued securitisations on their balance sheet. In the case of US open market CLO fund managers for whom this rule applied initially, a February 2018 court ruling reversed this requirement, further supporting the demand for loans. Also supporting demand is the strong growth in loan mutual funds since 2016 (Graph A, third panel). As a by-product of these developments, the substitutability between leveraged loans and high-yield bonds has increased from an investor's point of view, hence the convergence in their risk-return characteristics (Graph A, fourth panel). Factors increasing the willingness of and incentives for banks to provide credit may also have been at work. Recent shifts in the approach to enforcing leveraged lending guidelines in the United States seem to have made it easier for banks to arrange such loans. More broadly, the leveraged credit market has been buoyed by a favourable macroeconomic background and strong equity markets. Corporate restructurings such as mergers, acquisitions and leveraged buyouts have accounted for close to 40% of US institutional leveraged loan issuance since 2015. As business cycles mature, however, investors may start to incur losses. The default rate of US institutional leveraged loans increased from around 2% in mid-2017 to 2.5% in June 2018. Going forward, as monetary policy normalises, the floating rate feature of leveraged loans could trigger defaults by worsening borrowers' debt coverage ratios (DCRs): the ratio of net operating income to debt service costs. Despite healthy corporate profits in the last few years, market participants have begun to report lower DCRs. Even the loan recovery rates during the next downturn could be smaller given that the debt cushion - ie the level of unsecured junior debt that absorbs losses before senior loans in a default - of leveraged loans has decreased. Concerns also centre on funding and market liquidity risks. For one, the concentration of BBB borrowers has risen, which means that, in a downturn, downgrades among BBB borrowers to a BB or lower rating - ie speculative grade - would lead some investors to dump this debt. The relative illiquidity of leveraged loan markets could exacerbate the resulting price impact. Moreover, given that mutual funds are a major buyer, mark-to-market losses could spur fund redemptions, induce fire sales and further depress prices. These dynamics may affect not only investors holding these loans, but also the broader economy by blocking the flow of funds to the leveraged credit market. The interest rate on most loans is reset periodically to a spread over a reference rate, typically Libor or its equivalent. See http://www.leveragedloan.com/primer/, S&P Global Market Intelligence. In March 2013, US federal banking agencies issued Leveraged Lending Guidance (LLG) setting limits on parameters such as debt-to-income ratios and maturity. In October 2017, the US Government Accountability Office determined that the LLG is subject to the requirements of the Congressional Review Act, meaning that, in principle, the Congress can overturn it. See https://www.gao.gov/products/B-329272#mt=e-report. In early 2018, senior officials from some US banking agencies signalled greater accommodation with respect to leveraged lending. Relatedly, in September 2018, a joint statement by US banking agencies clarified the non-binding role of supervisory guidance, one that is distinct from laws or regulations. See https://www.federalreserve.gov/supervisionreg/srletters/sr1805a1.pdf. See B Hofmann and G Peersman, "Is there a debt service channel of monetary transmission? ", BIS Quarterly Review, December 2017. For evidence on the increase in concentration of BBB borrowers, see "Strong outlook with low inflation spurs risk-taking", BIS Quarterly Review, September 2017.